The British sci-fi/comedy from Joe Cornish will invade Blu-ray in October. 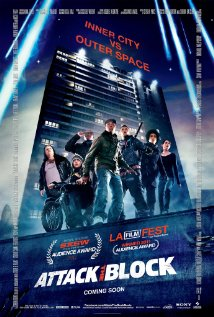 In an early announcement to retailers, Sony has slated 'Attack the Block' for Blu-ray on October 25. The film about an alien invasion and a street gang of Londonites who band together to save their apartment complex stars John Boyega and Nick Frost ('Shaun of the Dead'). The Blu-ray will feature 1080p video, a DTS-HD Master Audio 5.1 soundtrack, and supplements include: "Junior" commentary with writer/director Joe Cornish and actors John Boyega, Alex Esmail, Franz Drameh, Simon Howard, and Leeon Jones; "Senior" commentary with Cornish and actors Jodie Whittaker, Luke Treadaway, and Nick Frost; "Executive Producer" commentary with Cornish and executive producer Edgar Wright (Hot Fuzz); Behind the Block; Creature Feature; Meet the Gang; Unfilmed Action; and That's a Rap (an actual featurette, not me just ending the sentence). You can find the latest specs for 'Attack the Block' linked from our Blu-ray Release Schedule, where it's indexed under October 25.